I was wondering about how we will share the earth with all the dead after the resurrection. I can’t even imagine how many people that would be – millions and millions. There will be no room for everyone – the planet is overpopulated with the living as is. We can barely support ourselves. The answer came that we will all be in a new phase reality. There will be many translucent layers of existence, rather than one. This already currently exists, but isn’t visible or manifest to anyone except prophets and seers. But after the resurrection, we will all see like this. This will not be overwhelming. We will all have new eyes. We will all be able to shift our perception and see more, as we choose. We will not feel like our lives are crowded with people. They will be like the host of angels – ever present, but not always manifest. Marley awoke and there was water everywhere. Dark, murky water filled her mouth and lungs, but she didn’t need them anymore, because the same water filled her grave. She’d resurrected the moment Jesus had appeared in the sky overhead. Even though there was 6 feet of earth and well over 20 feet of water between her and the air, she still knew. She knew the same way Bradford pears knew it was time to bloom, when all at once, seemingly overnight, every one of them burst into shimmering snowflakes of petals, all over the city. How did they know? Scientists still couldn’t figure it out, but scientists couldn’t measure the Spirit, and that was what was at work, both with the trees and with Marley. She was lucky she’d been buried before “professionals” took over the laying out. When she died, her mother and her aunts had cared for her, just like they had when she was born. They took her down to the creek, a branch of the Stones River, and washed her body. It was like a baptism she’d never had. She’d died at 11 in 1843 of diphtheria. One week she was fine, and then she got a sore throat that seemed to take over all of who she was. It weakened her heart and that was enough to send her out of this world. Little did her family know but if that disease hadn’t killed her, the strain of her having a child later would have. Better to die now, with no obligations, nobody to leave behind. Her Granny had told her about Jesus, about his coming back, so what was happening now wasn’t a surprise. There’d been many quiet talks over the years while they quilted together or snapped beans for the evening meal out on the back porch. They had been looking forward to formally including her in the local congregation. That wouldn’t have been until the next summer when the preacher came by to do the yearly baptizing in the creek. Sure, she went to church, when she could, when she remembered, when there wasn’t something she had to do at the house. There were always chickens to feed or weeds to pull, and these things didn’t do themselves, as Marley’s Pa was always saying when she tried to put the chores off until later. “Best do them now, Marley girl, before something else comes up what wants tendin’.” He was right, of course, but all those “have to” things took away from the “want to” things, and to her mind the creek needed swimming and the flowers needed picking and the insects needed catching just as much as the chores needed doing. The days were just filled with things that had nothing to do with chores, but there was no way of getting around to it all. Marley always kept the Sabbath in her heart all her days. She was a simple girl, never one to pry or gossip. All children start off good, the only problem is that the clever ones were a quick study on how to be bad. It took smarts to figure out ways around the rules, and Marley was lucky in that she never had cause to worry about that being a problem. There was no school to go to, not for her, not for anybody in Old Jefferson. There weren’t enough families to pay for a building and a teacher, and there weren’t enough children to fill it. The nearest school was a three hour’s walk away and her family couldn’t spare her for that long with so many things to do around the homestead. She knew it was time to rise from the grave, the same as if it had been a school bell calling her. The call was silent but just as insistent, just as impossible to ignore. And why would she? Who would want to play hooky from heaven? She shoved against the rotten pine boards of the coffin, sending them swimming lazily to the side along with thick clumps of mud. It took her about 20 minutes to reach the surface, which in this case was the bottom of the lake. It didn’t take long after that to swim up to the air, but it was hard work, hard for muscles that hadn’t been used in over a century. Why was her grave underwater, she mused? Where did the lake come from? Where was her house? For that matter, where was the rest of her family? Surely they’d be rising with her, but she saw none of them nearby. Perhaps they were buried elsewhere? She didn’t dare consider that they might still be in the ground, like iris bulbs that had gone mushy, with no spirit left in them to bloom from the dark earth in which they were planted. The Corps of Engineers had flooded the town of Old Jefferson late in 1966 to make a hydroelectric dam, big enough to bring clean, reliable power to them and half a dozen other little towns to boot. The only trouble was that the towns had to relocate to higher ground to benefit from that progress. Power doesn’t do you any good if your farm is at the bottom of a lake. Moving the people and their livestock was hard enough, but then someone remembered the graves. There were hundreds of family cemeteries in the valley, often tucked away at the ends of farms, at the highest point, so that the well water wouldn’t be affected. Here the dead were laid to rest at the tops of hills so they be closer to heaven. But with the water coming, all the dead had to be relocated the same as the people. It wasn’t an easy task – living relatives had to be located, permission forms had to be signed and notarized. Many of the dead were moved to the Mount Juliet cemetery, but some stayed right where they were laid to rest however long ago that was. Sometimes the family had moved on or died out, meaning they couldn’t be asked for permission. 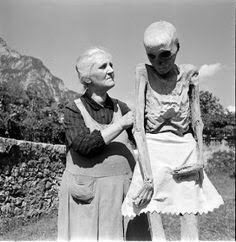 Sometimes the remaining relatives decided it was more respectful to leave their loved ones alone after seeing some of the other graves exhumed. Plain pine boxes and fancy mahogany ones all rot the same after a few years under the pressure of 4 tons of dirt from a standard size grave. It was a hard sight to see, all those coffins being dug up and falling apart. It wasn’t respectful, to their mind. Better leave them where they were. In Marley’s case, it was a little of both. The family had moved away not long after she had died, too distraught to live in the same place where their child had died. It didn’t make sense for her to go so young. Mama blamed herself for not taking better care of her, while Pa lamented that he’d not had enough money saved up to take her to the doctor. They’d left rather than have to answer all those ugly questions hanging around like dead fruit. It didn’t solve the problems, of course, just pushed them off until later. Unanswered questions always have a way of not staying quiet. The family had left the tending of their graveyard to the neighbors, who promised to keep the small plot mowed and free of trespassers. They assured her kin that they’d treat them like their own, and sent them off with sandwiches and a jug of fresh apple cider on moving day. In return they got the house and the farm signed over to them. Her family was ready to start again from scratch. They figured it was the only way to make up to Marley for letting her die. When the time came to move that plot, the neighbors had said no, in part upset at the hullaballoo created by the other exhumations, and in part hopeful that the Corps would give up on their plans. They thought that if enough people left the dead where they were, the government would have to relent and let the living stay. They didn’t count on the fact that the government doesn’t have feelings about people, whether alive or dead. It sure was a sight to see the dead come up out of the grey-green water that late August day. It was a Wednesday when it happened in Davidson County. The Rising had started a day earlier in Israel, and had traveled like a wave over the world, spending just as long in each area as the number of dead required. Some areas took longer than others. Some were full of the faithful. Some took barely a moment, in spite of the many thousands of graves there. The Messiah appeared in the sky, exactly as promised, trailing clouds of glory. Signs and portents had pierced the skies for weeks beforehand, but only a few people heeded them. Likewise, dreams and visions occupied the nights and days of many people, but most wrote them off to stress and took another Xanax or drank some Nyquil. They complained about their insomnia on their Facebook pages, not taking notice of how many others were having the same experience. It was a lot like when the first raindrops started to fall when the Flood happened. Nobody but Noah and his family thought it was going to keep on raining. It was a lot like when Sodom and Gomorrah were destroyed – all those people died, and only Lot and his daughters were mindful enough to leave. Noah, Lot, Joseph – they all heard the voice of God and took it seriously and lives were saved. Only those who took the messages seriously were saved. This time, many preachers told their flocks to ignore the messages, because they hadn’t heard the voice themselves. Surely God would speak to them, they thought. Why would God waste God’s time on the sheep and forget the shepherd, they mused. The problem was that they forgot that Jesus was the Shepherd, and they were the same as their church members. They’d forgotten that they weren’t in charge of anything at all. When they’d decided to take up the role of minister and do all the talking, they’d given up the most important part of following God – listening. Only those who’d remained humble pastors were called to the great awakening. They were the ones who remembered the One who was the true leader of the Church. Marley was listening, that was for sure. She rose up, high in the sky, and was greeted personally by Jesus. She asked him how this could be since she wasn’t baptized, and he said that she’d been baptized with the only baptism that counted, the one of the Spirit. He told her that a water baptism is something people do, for show. It wasn’t real. It was a hope, a promise. It pointed towards the real thing, but it wasn’t it. It didn’t mean anything at all when it came to being saved. That was something between the person’s soul and the Spirit, the presence of God in the world. Like called to like, with the Spirit calling and the soul responding. Water wasn’t necessary, because the Spirit could use any element it wanted. An element from the Earth was helpful, because it was a sign to the body. The soul knew when it was recognized by the Spirit, when it was welcomed home. The body needed a little more convincing, however, so some sort of ceremony was needed to remind it. That was all baptism was, he said, a reminding, a remembering, a joining back together with the side that had been forgotten during childhood. He told her that we are created in heaven, in the Spirit, and as babies are still attached to that world. Marley, having never truly left it, didn’t have any work at all to do to be part of that world again as a soul in a body. Many others had a lot more work to do, because being a soul in a body was distracting. It was so needy, the body, so demanding. It made them forget their commitments by replacing them with cravings. It provided daily (sometimes hourly) reminders that they couldn’t possibly survive in this world without constant and persistent re-turning towards the Light that is God. So Marley rose, far up into the sky, flying among the great crowd of people who truly followed God. They were people who were humble and pure, those who could hear the Master calling his faithful home. They had waited for a long time, asleep in the earth. Today was their true birth-day. Emma had no way of knowing how her experiment in home taxidermy would work out until she tried. She’d read up about it in a correspondence course, changing her name to Eugene on the paperwork. No self-respecting school would teach a woman how to do such work, especially if they knew how she planned to use this knowledge. She’d started simple – a dead raccoon she found near the edge of the field. A bird who’d gotten too close to a stray cat. It was unfortunate that the possum she’d spotted just down the road from the farm was too far gone, the turkey vultures having gotten first dibs. Sure, she still could have practiced on the mangy thing, but she wanted her artwork to look natural, or as natural as the deceased can look. It took her two and a half years to work up the courage to try on a human. This had been her plan all along, but she had to be sure of her skill before she tried something so bold. Even men wouldn’t be so presumptuous as to step into that field of work without official license. Emma knew too many folks in the village who went into debt over having to bury their dead. There was no good reason to spend a year’s income on someone who couldn’t appreciate it. New fancy clothes for someone who could never afford better than hand-me-downs his whole life? Nonsense. Silk lined coffin to sleep in, when cotton sheets were just fine all their life? Ludicrous. And worst of all was all those chemicals pumped into their veins to keep them fresh for whenever Jesus got around to making a return visit. When he came, he’d better have a shovel, a jackhammer, and a pair of wire cutters to help them out after he woke them from their slumber. 6 feet down stuck in a concrete vault and a locked coffin was bad enough. Their mouth wired shut (to avoid any unpleasantness during the viewing) would make life difficult for the newly reanimated. Who wanted to come back from the dead like that? Emma had another plan, a kinder, cheaper plan. Taxidermy. Dry out Grandpa Ross or Uncle Seymour so he doesn’t develop a case of the rot, and prop him up in a chair in the living room. Much cheaper, and he’d still be around to chat with. When the second coming happened he’d be just as ready as anyone else. Jesus was filled with a deep anger when he heard this and approached the tomb. The tomb was in a cave and there was a large stone covering the entrance. Jesus asked them to roll the stone aside. Mary saw a man in the garden not far from the tomb. She assumed he was the gardener. He was Jesus, but she did not recognize him. When he said “Mary”, she instantly knew who he was. The other women saw him as well, and they held his feet and worshipped him. The women reported to the disciples on all that had happened and relayed the message from the angel and Jesus to travel to Galilee, yet they didn’t believe them. The disciples thought they were making up the story.